Whenever you play a card, gain +1/+1. "Does anyone have some extra Boar Pelts?" 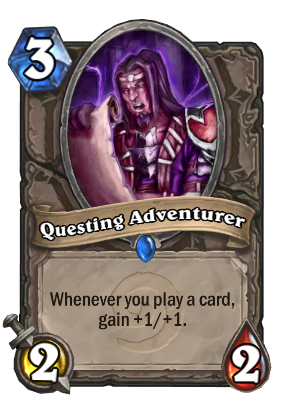 I finally got those quest cards people keep talking about! If this card became a 2 cost could it be viable in this rushing meta? If so than that must have been a glitch. There doesn't seem to be a reason it wouldn't work. If you don't have a dispel to counter this guy, he quickly becomes a large threat. That's a lot of quests. Have one of these in every deck and often two. If you can keep him alive for a couple turns he can become insane.Master of Disguise is useful for keeping him safe while he matures.